Ok, so it’s been a little while since I did one of these…here goes. Sooo… I’m gonna pretend that I don’t know what Racism is. …and this. Now I’m really gonna cop it. 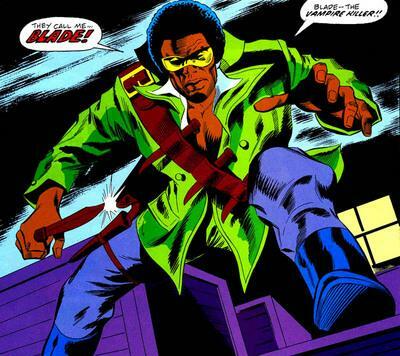 One of Marvel Comics’ lesser known hate-crimes against African-Americans was a blaxploitation throwback to Van Helsing. 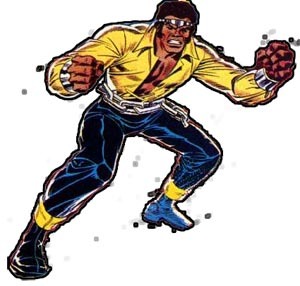 I would say that it’s amazing that a character like this ever caught on, but for crying out loud, Luke Cage is still walking around the Marvel universe so, you know, what the hell do I know? He was dressed like this. Seriously. 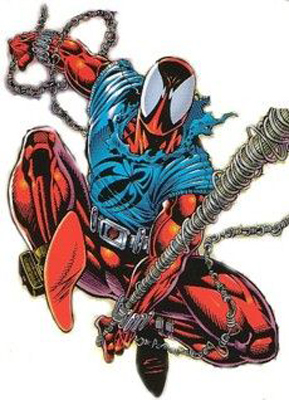 So when the movie guys get together and discuss potential projects to develop and make themselves a ton of money, I can totally imagine that they would pick a character that was second tier to a character stolen from a “classic” work of fiction. In The Tomb of Dracula #10 those creative geniuses Marv Wolfman and Gene Colan (actually, those guys are pretty good) introduced Blade – a half-human, half-vampire, all attitude avenger upon the undead. Characters like this, in titles like this, are created to be discarded. Somehow, Blade got popular. After the massive critical success of flicks like Tank Girl, The Phantom and Steel, the prospect of a Blade movie must have seemed akin to printing money. That whole sentence was sarcastic. Truthfully, I can’t fathom why this was green-lit, but there must have been a whole bunch of executive-type folk who were laughing all the way to the bank when the cash did start rolling in. 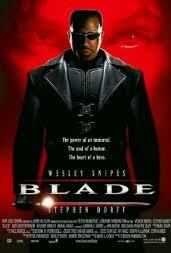 Blade is a flick that hit perfectly at the time it was released. On reflection, it hasn’t aged well – largely due to the over-the-top machismo performance of Snipes in the lead role. I acknowledge that it is the basis for everything that the character is about – he’s tortured, alone, determined, grim and a one-man army – but he’s also a character that cannot be permitted to develop, lest he find some semblance of emotional stability and become less interesting…and holy crap I just realised that I could be talking about Batman. But make no mistake, this is still a fun-run of an action flick, with decent fight choreography prior to the release of The Matrix, an interesting story, and what I count as a really engaging turn from the criminally underrated Stephen Dorff as the villain, Deacon Frost. This is where things get good. I remember being blown away by this when I first saw it, then going through a stage where I found it incredibly off-putting, but now I am firmly convinced that Blade II far outshines anything else in the entire saga. The reason for this is, well ok, it’s a combination of many factors – but all of those factors can be traced back to the decisions of one man: director Guillermo del Toro. I will take your childhood… and I will find a way to make it kill you. 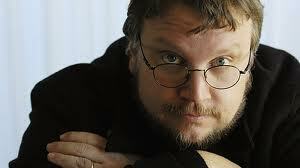 Del Toro is a phenomenal director. Check out his debut, Kronos, his betrayed fairytale Pan’s Labyrinth and cry for an hour over the fact that he won’t be doing The Hobbit. He is a man who knows how to work horror in intelligent ways and develop characters so that you are so invested in these guys that you can’t turn away from the gross. These qualities are on display in Blade II, as The Daywalker must team up with the vampires he hates in order to kill the vampires that they hate. It’s not complicated. Snipe’s posturing is rendered bearable this time around by the addition of the Blood Pack – a vampire super-team who look like they missed out on their Matrix Reloaded auditions. Seriously, these guys combined are packing more testosterone than the bulls of Pamplona – and yes, the chick too. 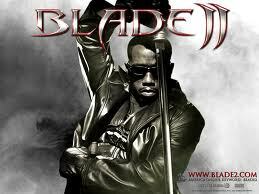 They make Blade look like Obi Wan Kenobi. 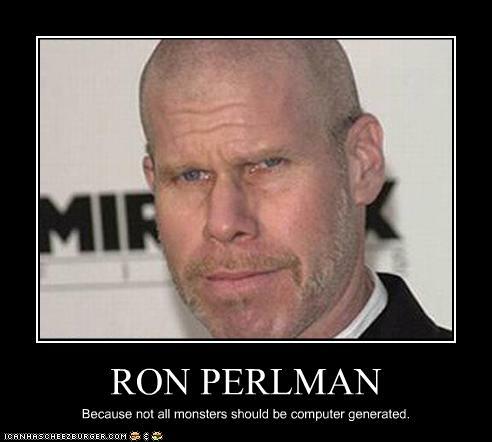 What they have going for them is the inclusion of legendary action choreographer Donnie Yen, the guy who played Cat in Red Dwarf (Danny John Jules…that’s not a joke either) and the one man whom you may have begun to work out over these reviews I have a bit of a crush on: Ron Perlman. So, it’s better than the first one, yeah? I’m not saying that the Oscars should consider a Best Vampire Film category (no jokes people… the Academy is a serious business), but Blade II makes for a decent night’s escapism. Then some #$@*er made Parker Posey a Big Bad. Some of you are aware that many of the creative types working in the industry are the latter-day versions of geeky fanboys from days gone by – and as a geeky fanboy myself I make this statement without disdain. One of the frontrunners of this trend, most specifically a fanboy of comics, was a young writer called Dave Goyer. Goyer got his start with a Van Damme screenplay, worked his way through to the brilliant Dark City, and was then involved in the fanboy dream: bringing one of his beloved comic-book heroes (well… anti-hero) to the big screen. Incidentally, Goyer went on as a writer to be involved with Batman Begins and The Dark Knight. That is all that ever needs to be said. and I found his smart-mouth to be the most entertaining part of the flick. The problem is that shouldn’t be the case when the movie is an MA rated actioner. And so this comes down to a film being made because they’d already made two, and we can’t finish this thing if it’s not a trilogy, right? Now, before I wrap this up, I must make fair mention (this being a “franchise” review) of the short-lived Blade: The Series. I’ve not seen it, and I never will. But you’re aware of its existence, as am I. May God have mercy on us all. This other Blade? He’s a rapper. I take no further responsibility for your decisions. The Blade movies actually work better by not watching them together. Treat each one as a separate adventure, more like James Bond with fangs than an actual trilogy. You can have a great night in by pairing Blade II with Del Toro’s first English language flick, Mimic. 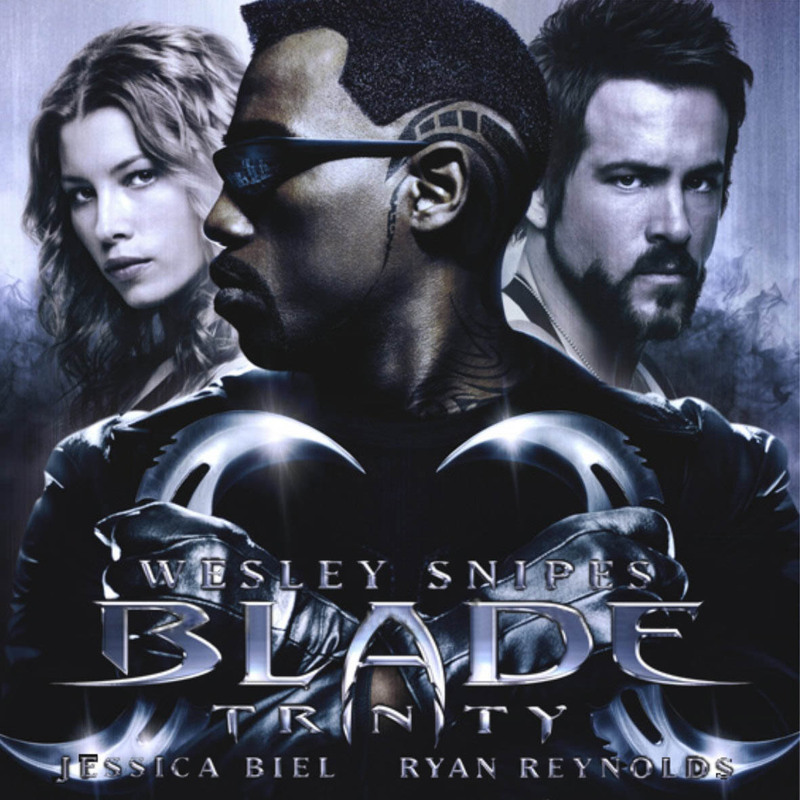 And I recommend a drinking game to get through Blade: Trinity: a drink anytime someone says “Daywalker”; a drink anytime someone makes a hissing sound and bares their fangs; a drink anytime someone explains a piece of the plot to Blade; a drink anytime you wish they’d given Ryan Reynolds a bigger role. To be honest, there’s so much to play with here, I’d be just as interested in seeing the drinking games you could come up with on this flick. Hi Zee. I think Blade still holds up. It’s got one of the best opening sequences in motion picture history. Wes Snipes is so bada$$ in the film. The fight scenes are awesome. There is not one flat bit in this whole movie. 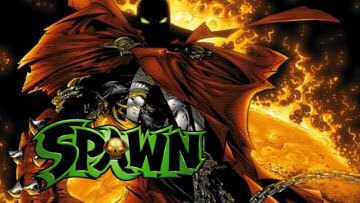 It’s almost the perfect comic book film and adaptation. For the record the producers got the film rights to this for $60,000. This really is where reviewing is revealed as a matter of personal taste. I won’t argue that Blade was done well and still has a fair bit to recommend it. But one of the things you cite as a plus – the fact that Snipes is a bada$$ – is exactly one of the things I find offputting these days. He’s bada$$ in the kind of overblown machismo way that I find irritating. But that’s my take, and it’s something that actually works well for others, and that’s cool. I don’t know I could go anywhere near saying it’s a perfect adaptation, since the nature of the character meant that they could take anything or nothing from the comics and it would still work well for screen. Case in point: Deacon Frost bears next to no resemblence to his comic-book counterpart. 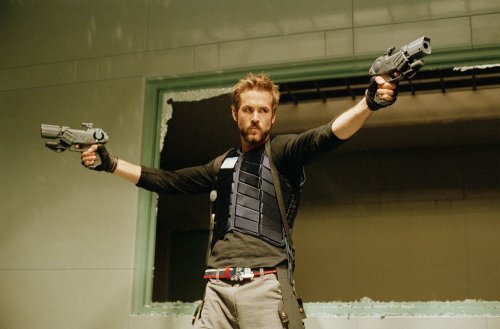 Blade trinity drinking game: how about a drink every time there’s a gratuitous piece of product placement. Thank you Apple. Nice one! Hopefully that will get people too drunk to notice that sticking earphones in for a fight is probably not a great idea. 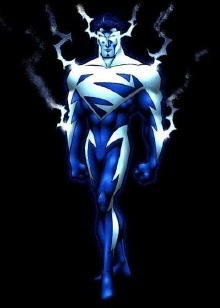 heh heh…well, in the end he was only superhuman.